InovaCat has developed, and is the sole owner of GASOLFIN™ - Breakthrough process for Maximum Propylene and BTX. The new GASOLFIN™ gasoline-to-olefins technology converts low-valued gasoline / naphtha’s into high-valued propylene, butylene and BTX. GASOLFIN™ has the highest product yields (> 28wt%), the lowest production cost (30% of next best technology) and lowest energy usage and CO2 emissions (minus 30%) of any maximum propylene technology existing today. The GASOLFIN™ technology is uniquely flexible: Its production can be shifted towards the highest valued products, while it possesses maximum feedstock flexibility converting any available naphtha stream into maximum propylene. The GASOLFIN™ technology may be inserted into almost any existing refinery or petrochemical plant configuration. Investment payback time of a GASOLFIN™ unit is less than 18 months. The interest of the refining and petrochemical sectors has been very high with various strategic partnerships in the making. INOVACAT intends to market this technology through a conventional catalyst licensing model. The GASOLFIN™ technology offers an unparalleled opportunity for a producer to enter the petrochemicals market or expand current production rates with a significant cost and market advantage. ...makes use of a proprietary catalytic system comprising modified zeolites tailored for the selected feedstock. Several technologies, such as Propane Dehydrogenation, have utilized precious metal or chromium based dehydrogenation catalysts to extract hydrogen to produce propylene. While these technologies having been commercially proven they present several distinct disadvantages including high coke yield leading to short operating cycles and complex regeneration procedures. The primary disadvantage inherent in each of these processes are their complexity combined with very high capital and operating costs. The heart of the GASOLFIN™ process is a proprietary catalytic system which has been developed by INOVACAT. This process has been developed based upon proprietary graded catalyst beds containing synergetic functionalities. The catalyst bed has the distinct advantage of optimizing conditions for cracking gasoline boiling range hydrocarbons immediately into propylene and butylenes. The graded mixed catalyst bed guarantees long operating cycle times by minimizing deactivation reactions such as coke formation. ...is a low pressure, moderate temperature operation utilizing standard processing equipment. The reactor section consists of multi-staged fixed bed reactors. Naphtha feed is delivered to the conversion section where it is heated to reactor inlet temperatures. The light olefin product is separated from the reactor effluent after exchanging heat with the feed. The gaseous products include a fuel gas stream (hydrogen through ethane), a propane/propylene stream and a butane/butylene stream. The olefin content of each of these streams exceeds 90% in most cases. Additionally, an aromatic stream enriched in benzene, toluene and mixed xylenes is also produced. Non-reacted gasoline is recycled to the fixed bed reactors while the vapor product is compressed and separated into propylene and butylene product streams via standard distillation. A small quantity of diesel is produced. Additionally, an aromatic stream enriched in benzene, toluene and mixed xylenes is produced. 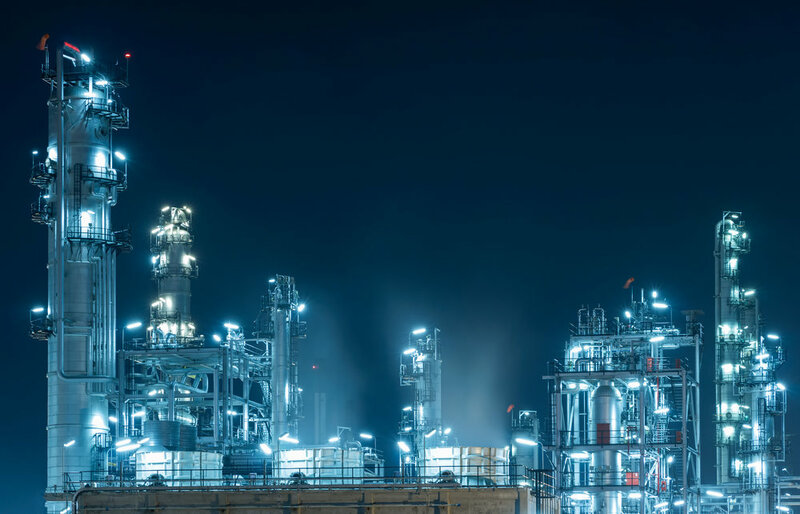 The two most common petrochemical building blocks are olefins and aromatics which include respectively ethylene, propylene and benzene, toluene and xylene. Oil refineries produce olefins and aromatics by Fluid Catalytic Cracking (FCC) and Catalytic Reforming of petroleum fractions. Chemical plants produce olefins by Steam Cracking naphthas or natural gas liquids. Olefins are the basis for polymers and oligomers used in plastics e.g. polypropylene, resins, fibers, elastomers, lubricants, and gels. Olefins and aromatics are also the building-blocks for a wide range of materials such as solvents, detergents, and adhesives. Polypropylene is the leading high performance plastic used for a wide range of durable plastics used in the automotive, electronics, and many other industries due to its high performance characteristics. Additionally, polypropylene is easily recycled resulting in far less environmental impact than many other widely used plastics available today.